Gutter Gardens™ make gardening hassle-free and fun. 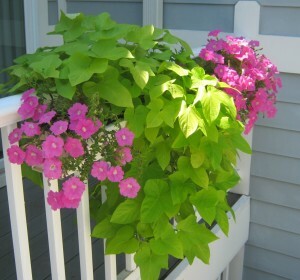 These durable planters can hang from almost any railing and are EASY to install. These planters make excellent window boxes. People like them because they won't fall apart, they're made from recycled materials and they are even attractive when the growing season is dormant. They will never break, fade, crack or fall apart. Gutter Gardens™ are lightweight and can grow almost any kind of annual flowers and many herbs, lettuces, kale, radishes and spinach. Best of all they are out of reach of the deer, rabbits, dogs and slugs that tend to destroy a flower bed. AND, you can Stand Up to Garden. Make growing fun again…buy some Gutter Gardens™. A great gift for apartment or condo dwellers. This product is hand-made in the USA from recycled aluminum. It comes in two sizes (6 inches wide has a root depth of 4.25″ and the 8 inch wide planter has a root depth of 5.5″) each very capable of growing a variety of annuals. Price is determined by the width and length. See the store for the planters you want. All hardware is included in your purchase. Cable ties made from stainless steel and stainless steel screws insure secure, rust free mounting. We foster dogs and they were always knocking down our planters. Gutter Gardens are securely fastened to the railing and we love the extra color on our new deck. We bought five Gutter Gardens to attract Hummingbirds to our deck and are not disappointed. 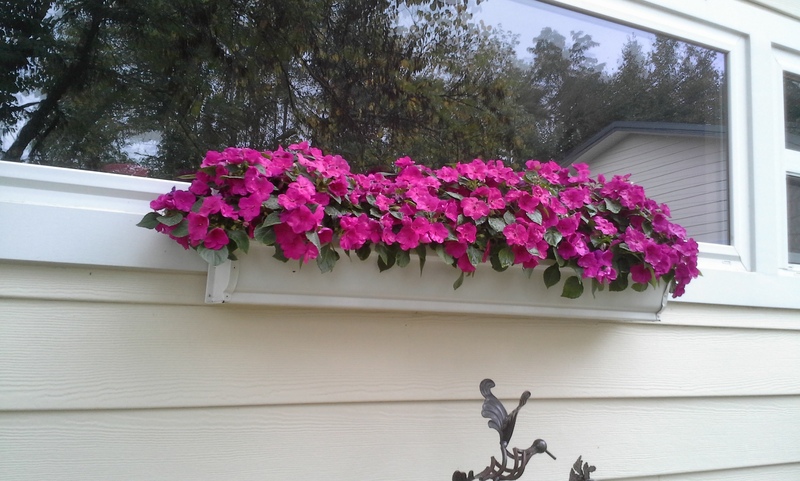 We have almost total shade, but found that impatiens grow very well in these planters. What a great idea! I just love how easy they were to mount and am very pleased with my ‘unique’ planters. Moving from our house which had lots of trees and flowers to a high rise Condo was quite an adjustment. My balcony feels more like home now that I have some flowers to look at and tend to. My Gutter Gardens were installed for me and are mounted on the inside of the deck so I can enjoy them. I always wanted window boxes but they were too expensive and I didn’t know how to mount them on my brick house. Gutter Gardens came over with all the necessary tools and I am so pleased. All the neighbors are jealous!